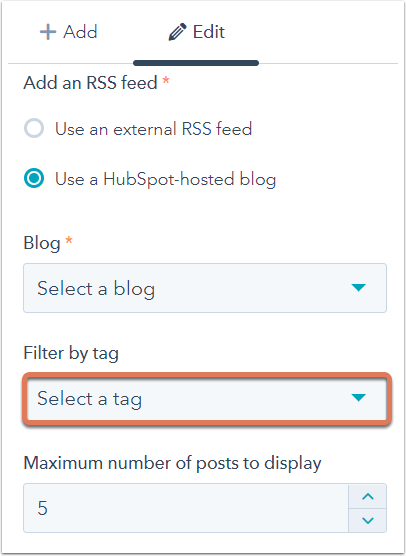 To add a tag-specific stream of recent blog posts to one of your HubSpot website or landing pages, access the page's template to add a RSS Listing module. In your HubSpot account, navigate to Marketing > Files and Templates > Design Tools. Click the name of the template you want to edit. In the inspector, click the + Add tab. 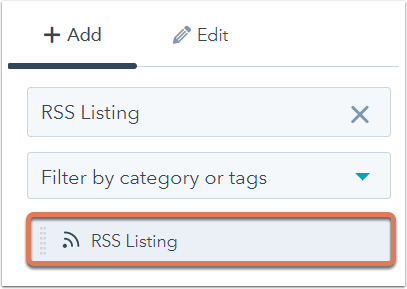 Use the search bar to search for the RSS Listing module. Then click and drag the module into your template. Click the RSS Listing module once it's in your template. In the inspector under the Edit tab, customize your RSS Listing options. Select the Filter by tag dropdown menu and select the tag you wish the RSS feed to pull in blog posts for. When you're done, click Publish Changes in the top right-hand corner of the template. When finished, the steps above will add a tag-specific stream of relevant blog posts to any pages using the template you edited.